Barclays launched a new fund to lure fans of Robert Shiller’s Cyclically Adjusted Price Earnings Ratio (CAPE Ratio), a valuation methodology that is catching on with investors. Robert Shiller’s original CAPE ratio sought to find the best times to buy or sell stocks as a whole asset class based on their share price relative to historic earnings. The CAPE Ratio is calculated by dividing a company’s per-share price by the inflation-adjusted average earnings for the past 10 year period. Barclays new ETN will use different rules than many Shiller fans. Rather than use the Shiller CAPE as a way to determine whether stocks or over or under-valued relative to fixed income products, Barclays will use the Shiller CAPE to find the most undervalued sectors based on the sectors’ current ratio compared to a historical average. The fund will take positions in only four different sectors at one time, hoping to expose investors to the most undervalued stocks while steering clear of industries where companies may be overvalued. If the fund strategy proves successful, investors would expect total returns significantly larger than the broad market. Shiller’s CAPE has plenty of supporters – and plenty of dissenters, too. The ratio is highly-controversial as it is, at its core, a tool for market-timing with the belief that some companies can be over- and undervalued based solely on the historical relationship between price and inflation-adjusted earnings. 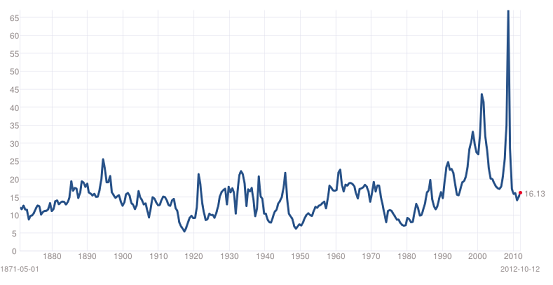 Historically, the S&P 500 has a median CAPE of just under 16. The current ratio is 22.41, according to multipl.com. If one were to use these metrics in the way Shiller intended, an investor would significantly underweight equities relative to their fixed-income investments. One criticism of the ratio is that it does not take into consideration the available yields on risk-free fixed-income investments like US Treasuries, which many investors are shorting right now. Right now, with rates at record lows, one would have to question whether or not it makes sense to overweight low yielding debt investments when, based on the Shiller CAPE, returns in equities should be much higher than risk-free investments going forward. Barclay’s chose an interesting set up in creating this particular product as a note rather than an exchange-traded fund. As with all notes, this exchange-traded product will interject some counterparty risk in the investment. Those who hold the note incur the risk of default by Barclays, or from the counterparty that Barclays “bets” against in the derivative market. The ETN will be backed by real assets. The ETN will hold four options on the industries it believes to be most undervalued based on the Shiller CAPE Ratio. However, note that an exchange-traded note is an unsecured debt facility on the books of Barclays. A Barclays bankruptcy could result in the loss of capital. An ETN does have one major advantage: lower fees. Barclays will charge investors only 45 basis points per year to hold the ETN, which is very inexpensive given that equity funds – especially sector rotation funds – tend to require very expensive active management. One competitor, the Huntington US Equity Rotation Strategy ETF (HUSE) charges a massive 1.29% annual expense ratio. Another similarly themed broad category fund to consider is the very popular permanent portfolio ETF is meant to stand the test of time with low volatility. Bottomline: The Barclays ETN+ Shiller CAPE ETN (CAPE) is an interesting and inexpensive way to get tactical asset management for those interested in chasing sector-rotation investment strategies. Disclosure: No positions in any tickers mentioned here. Next post: Will Germany take Greece to the slaughterhouse?